The advisory, serves as the core of your travel risk management service, which is issued by the agent at time of booking or automatically by your mid-office system (see distribution partners). How do travelers get their personal Advisory ? 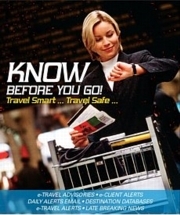 Feature:emailed Advisories include a link for the traveler to "pull" the most current version of their personal Advisorybefore and whilethey travel to review updates or additional Alerts. What does an Advisory include?